Frame social problems, and identify solutions, through the lens of politics. Always controversial, and ever more polarizing in today’s political climate, social problems take up a huge chunk of our cultural bandwidth. 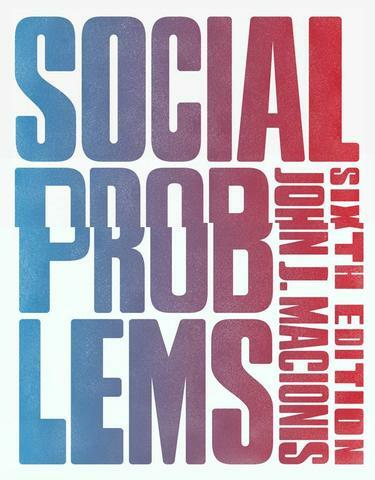 Rather than simply presenting social problems as a series of facts, the sixth edition of Social Problems focuses on how people construct problems, and how they develop potential solutions, based on their political attitudes. Analyzing issues from liberal, radical-left, conservative, and libertarian points of view, author John Macionis explains why people disagree about what the problems are, and how one person’s “problem” may well be another’s “solution.” Once you understand how social problems are defined politically, you'll be able to develop your own positions, and you'll have the knowledge you need to engage in solving social problems through activism and political discussion. Social Problems, Sixth Edition is also available via REVEL™, an immersive learning experience designed for the way today's students read, think, and learn. Learn more.